Almost as if it’s to spite us for previously having picked holes in Listener preambles, here we were with a non-existent one, apart from what appears every week: “The Chambers Dictionary (2011) is the primary reference”. 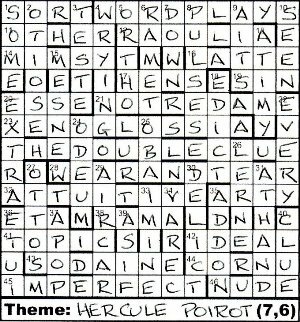 Given the title and “Theme: ______ (7,6)” written below the grid, it seemed that we would have a puzzle or two to unravel before discovering what was going on! 1ac Tortuous tours group (4) shouted out SORT as an anagram without the U, but then 16ac … and elsewhere takes time after knocking back coffee (5) shouted out LATTE (T in ET AL reversed). So I may have been wrong about 1ac … or more likely, there were two (or more) clue types in use. 19ac referred to four other clues, so that looked suspicious, but obviously couldn’t be solved for a bit. Half a dozen answers later, some of which had an extra letter in the wordplay, I came to 41ac. 1ac first letters of 11 45 40s to produce theme (5). Although it was only 5 letters, with the entry below the grid being given as (7,6), it looked as though the answer to this clue would tell us everything … or be a red herring. I made a good start on the down clues, and then came to 18dn First letters of 22 7 45 40 tender instruction (5). I wondered what the instruction might be: sleep, faint, choke, scoff? 7dn probably began with D for deserted, so it was possible that the answer, ·D··T, was just EDICT. Unclued entry is an appropriate title. Their poor clue. Read the extra letters. It seemed that I was doing everything in the wrong order. The only thing outstanding was to sort the “other” imperfect clues. This had to refer to the acrosses, and it didn’t take long to make HERCULE POIROT from the letters that I had already identified: their poor clue. The Double Clue was one of Poirot’s cases. I double-checked the preamble to see if any highlighting was required, and was relieved to find it wasn’t. So thanks to Ilver for a thoroughly enjoyable puzzle. I just hope that he hasn’t made the editors think that preambles really are superfluous to requirement! This entry was posted on 1 March 2013 at 5:00 pm	and is filed under Solving Blogs. You can follow any responses to this entry through the RSS 2.0 feed. You can leave a response, or trackback from your own site.